Pitch Diameter .208" to 36.000"
Boston spur gears are designed to transmit motion and power between parallel shafts. Configurations include spur, rack, pinion wire, stem pinions and internal gears; most with a selection of bores, keyways and set screws. 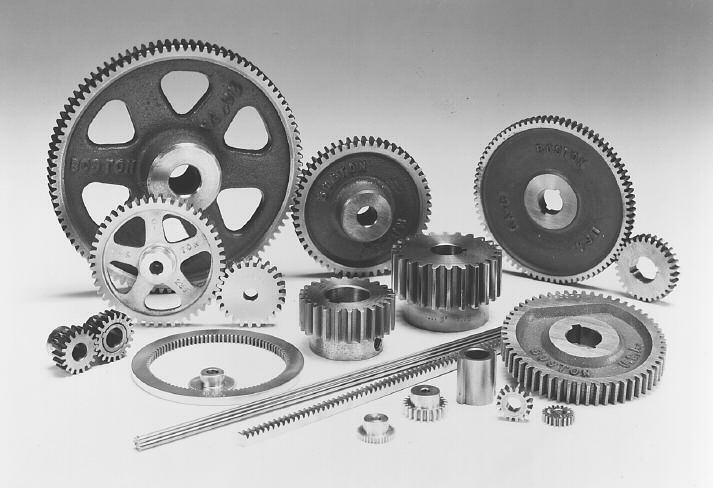 Fine-pitch gears are available in plastic, brass, stainless steel and steel. Heavier pitch spurs are available in steel and cast iron. Styles include plain, web, web with lightening holes or spoked. Change gears have consecutive numbers of teeth for a variety of ratios. Boston Gear manufactures both 14-1/2?and 20?PA, involute, full dep system gears. While 20?PA is generally recognized as having higher loa carrying capacity, 14-1/2?PA gears have extensive use. The lower pressur angle results in less change in backlash due to center distance variation and concentricity errors. It also provides a higher contact ratio and is consequently a smoother, quieter operation provided that the undercut of the teeth is not present. Boston spur gears are designed to transmit motion or power between parallel shafts. Configurations include spur, rack, pinion wire, stem pinions and internal gears; most with a selection of bores, keyways andsetscrews. Styles include plain, web, web with lightening holes or spoked. Change gears have consecutive numbers of teeth for reduction uses. 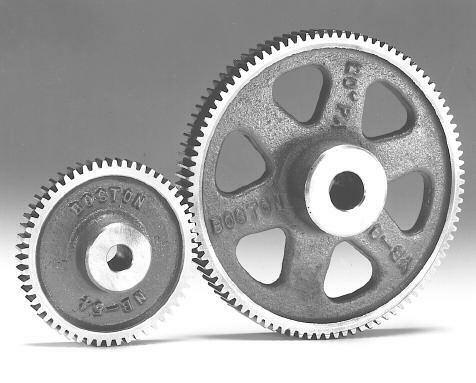 Boston fine-pitch spur gears are available in Delrin and Brass. Configurations include spur, rack, pinion wire and internal gears; most with a selection of bores, keyways, and setscrews. Styles include plain, web with lightening holes or spoked. 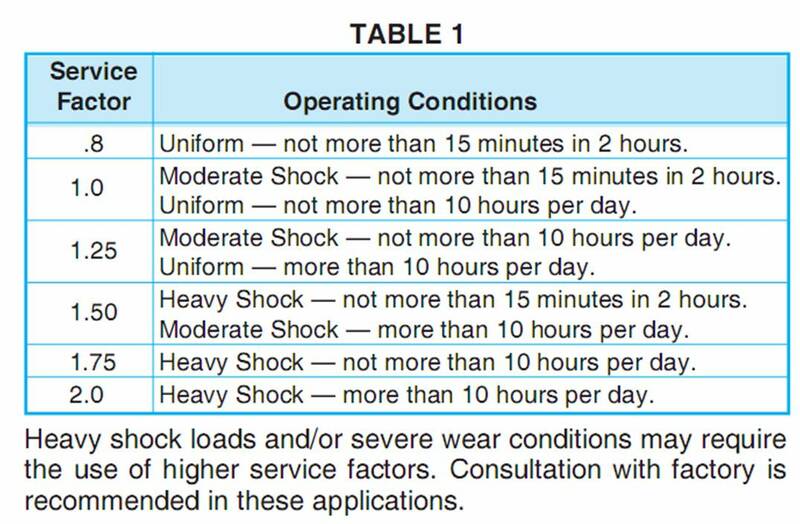 b.With knowledge of operating conditions and load classification, select service factor from Table 1 below. 4.Select a driven spur gear with a catalog rating equal to or greater than the horsepower determined in Step 2. All ratings are predicated on gears properly lubricated and maintained. A.Select pinion having pitch diameter at least twice the shaft diameter. B.Pinion number of teeth should be greater than 16 for 14-1/2?PA and 13 for 20?PA to avoid excessive unde cutting. C.For tooth numbers or RPMs not on Chart, interpolation of horsepower is adequate. D.Pitchline velocities above 1000 FPM are not recommended for metallic spur gears. The Selection Chart reflects this in the lack of ratings for larger numbers of teeth at higher RPM/s. Ratings to the right of heavy lin are not recommended, as suggested maximum velocity is exceeded, and should be used for interpolation purposes only.